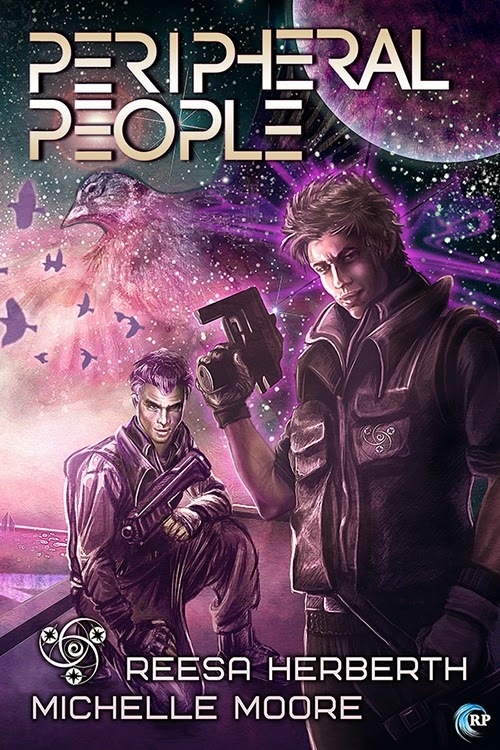 Peripheral People is an interesting blend of sci-fi, murder mystery, and romance novel. I’m not sure it achieves everything that it could do in each of those areas, but it’s certainly a valiant effort. Essentially, the narrative follows a team of four investigators for an interstellar body as they dig into a series of murders. Two of the investigators are a ‘psy team’ ; one has the ability to read psychic traces, and the other serves as his ‘ground’, pulling him back out when this gets dangerous. I have to give the authors marks for the setting; the ‘Ylendrian Empire’ in which the narrative is based isn’t really explored directly, but through character memories of worlds they’ve seen, references to other investigative branches, and other subtle cues in the environment and dialogue. There’s enough meat over the implied structure to make it work, and the minimalist descriptors leave the reader able to draw a lot of the structure in the imagination – it works surprisingly well. The only real distinction here is in those areas of the world which the characters interact with – the ‘IEC’, a sort of interplanetary police force, and the various psy-training measures. The former is given a bit more of a gloss, but really it feels like a modern police department; the discussion of psy ethics, of the various abilities manifested, the consequences of using them…these are all approached in a nuanced way. In particular the text unflinchingly approaches ‘burnout’, the loss of power, and the possibility of being one of the unpleasantly labelled ‘pharmed out’ – psy agents who use drugs to suppress their powers, with typically unpleasant side effects, It’s a sparse world, but it’s been crafted to let you put your own layer over things, and where the detail exists, it’s unflinching and honest. The investigative narrative is alright. It’s a by the numbers murder piece really. The inclusion of psychic imagery as an investigative tool is a nice touch, and where it’s used, the elaborate images drawn in the prose are both effective and affecting. That said, whilst everything rumbles along to a conclusion (and that conclusion is actually rather surprising and well done), the intervening stages don’t feel like they have enough in them. There’s a few leaps in logic that I wasn’t sure were entirely justified (though they were helpful from a plot point of view), and several moments where an antagonist suffered the urge to explain his diabolical plan in great detail, for…no particular reason, really. The real core of the text, though, is the relationship between the four members of the investigative team. The effervescent psy, his more normal ‘Ground’, and the pragmatic, phlegmatic investigators they look into the murder with. What begins awkwardly, with believable resentment on all sides, gradually evolves over the text into something more. I won’t go into detail here, as with the above, to avoid spoilers – though I will say that some of those relationships turn to romance, possibly not the ones you expect – and they do so in a fairly explicit manner. If that’s going to be a problem, this might not be the book for you. If you’re alright with that, then carry on. The relationships that build do so, perhaps, a little quickly – but that may be a side effect of being a single novel set of character arcs. But the emotions described are believable, raw, and very well written. Overall then, this is actually a decent read in its niche. It would be nice to see more from the investigative side, and maybe a bit more nuance to the non-romance relationships, but still, this is a surprisingly good read, if you’re looking for an unflinchingly adult sci-fi romance.